Cupcake, my love: Here Figgy, Figgy! While at the grocery store last week I was slowly pushing my unmanageable cart down the produce department. I felt like I was a drunk driver who couldn't keep control of their car...only problem was I wasn't drunk, and it was my grocery cart, not my car! Getting more and more frustrated I began to think about how much I hated grocery shopping. I'm one of those people who plan out their meals for the week and only take on trip to the store, only to spend upwards of one hundred dollars a week and being faced with the miserable challenging of carrying all my groceries in by myself. Needless to say that with a misbehaving cart I was on the brink of foregoing grocery shopping for the week and living on pizza delivery. It was at that very moment that I had, unknowingly, made my way all the way to the back of the produce department only to find myself in front of a big wooden shelf full of dried fruits and a variety of nuts. My interest was peaked. Dried pears, Bourbon candied pecans, dried mango, trail mix...and a big bag of mission figs! I have been craving figs for a while and could not believe that I had almost missed this opportunity all thanks to a stupid grocery cart. I excitedly put the figs in the cart, scurried through the other aisle picking up the rest of my items on the list and making my way over to the check out. While standing in the check out line my brain was running wild thinking of what I was going to create with my treasure find. I had an immediate attraction to the idea of a cookie. I started thinking that something salty might also be a really good compliment to the sweet figs. 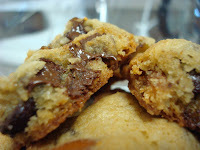 Knowing that I wanted to add chocolate to my salty, fig creation, I was slowly starting to form one of the best cookie recipes I have EVER had! Little did I know how big a hit this cookie was about to become. Stumbling through my front door with five bags of groceries on each arm, I dumped them all on the kitchen floor and immediately got to work. Yes, that's right I left my grocery out while I concocted my cookie recipe...I mean what's more important here people? I used a basic chocolate chip cookie dough to start. I then delicately opened my bag of figs, as if they were a precious package that was fragile even to the touch of soft hands. Reaching in I gently scooped out a handful of the deep purple figs, laying them out on the cutting board, ready and willing to dice them up into little pieces. I think my initial delicacy with them was my way of saying sorry for what I was about to do. Once I had the figs prepared and added to the chocolate chip cookie dough I opened up my pantry door and found my secret ingredient. PRETZELS! I grabbed two big handfuls of the salty, crunchy pretzels and crushed them with my hands over my mixing bowl. Carefully mixing the pretzels into the dough I couldn't resist anymore I had to take a bite. I dipped my small silver spoon into the saltfully sweet dough and scooped out a huge chunk, making sure to have a little bit of everything in my first bite. Opening my mouth with fingers crossed I was met with an explosion of flavor and textures. The dough was somewhat sweet, thanks to the chocolate chips, but the figs added a chewy texture that was meet perfectly with the salty crunch of the pretzels. As the dough melted away in my mouth I found myself quickly reaching for another spoonful, and another, and maybe one more. Forcing myself to stop eating the dough, I dropped them by the spoonful on to my cookie sheet and sent them off to the oven. 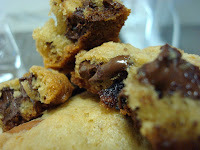 Even as baked cookies they still held onto their texture variety and were even more amazing with the meltiness of the chocolate chips. My friends and family could not stop raving about how light the cookies were, but still had a delicate sweetness to them, and were totally shocked with the pretzels bites. 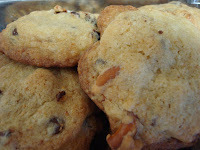 I invite all of you to give these awesome cookies a try, your taste buds will love you forever, and you'll actually be thankful that you made that dreadful trip down the grocery store aisle! Combine flour, baking soda and salt in small bowl. Beat butter, granulated sugar, brown sugar and vanilla extract in large mixer bowl until creamy. Add eggs, one at a time, beating well after each addition. Gradually beat in flour mixture. 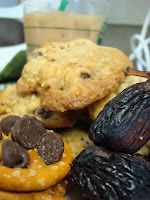 Stir in chocolate chips, figs and pretzels. Drop by rounded tablespoon onto ungreased baking sheets. BAKE for 9 to 11 minutes or until golden brown. Cool on baking sheets for 2 minutes; remove to wire racks to cool completely. Love the idea of adding the pretzels. I bet the salt from the pretzels really paired well with the figs. YUM! Clever idea!